Gran Vía 1A Apartment is a 65m2 apartment located on the first floor of the building. The apartment offers a living room, a large bedroom, fully equipped kitchen and a bathroom. The apartment features high quality fittings, where design and fine materials go together. A perfect choice for couples or friends. - Check in at the apartment on the 24th, 25th and 31st December is strictly only possible before 20:00. Reservations with check in after this time will not be accepted. Apartamento correcto para una estancia céntrica en Madrid. El apartamento es amplio, cómodo y muy bien situado. Es cálido y limpio. Las fotos publicadas no se corresponden a ese apartamento. A damage deposit of 200 € will be guaranteed by your credit card. For check-in from 00:00 there is an extra charge of 40 €. 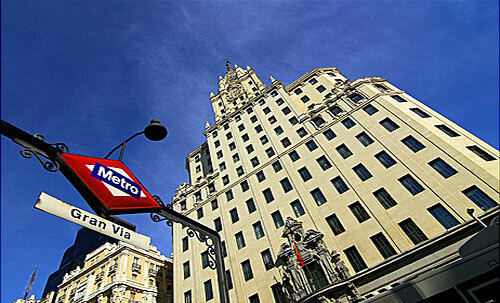 The apartment Gran Via 1A is located in Gran Vía and Callao area. The apartment is located in Valverde St, a small quiet street in a dynamic area, situated next to Gran Vía and in easy reach of restaurants and bars. It is located in central Madrid. Crossing Gran Via and Calle de Alcalá, you'll get to Plaza del Cibeles. Located on the intersection of Calle de Alcalá with Paseo de Recoletos and Paseo del Prado, distinctive for its central fountain built in 1782 (Cibeles fountain) and for the four representative buildings; Buenavista Palace (Army base), Linares Palace (America House), Commications Palace (home to Madrid's Mayor) and Bank of Spain. Following Calle de Alcalá you'll find another symbol of the city, Puerta de Alcalá, which owes its name to Alcalá de Henares who took this way to the city. From Plaza de Cibeles, following Paseo del Prado towards the south some 10 minutes, you'll reach the Prado Museum, Thyssen-Bornemisza and the Royal Botanic Garden. To the south east, just 800 metres from the apartment is 'Zero Kilometre', the centre of Madrid and Spain, located in Puerta del Sol. The Royal Palace, Almudena Cathedral are less than 1 kilometre from the apartment, just 20 minutes walk away. Calle valverde, nº 12, 30€ approx a day. Plaza la Luna, 5 minutes from the apartments, costs approx 26€ a day. Gran Vía - 0.16 km. From the beginning, malls, designer stores and movie theaters opened their doors here. Today it is well known as the Broadway of Madrid due to the large number of cinemas and theaters. Puerta del Sol - 0.45 km. On this square you can find the Kilometre 0, which is the center of the radial network of the six main roads streets in Spain which are reaching from there over the whole peninsula. Chueca is a central neighborhood in Madrid named after Federico Chueca, spanish composer of zarzuela. The area lies just to the north of the old city and is centered on the Plaza de Chueca. Very pleasant (and surprisinly spacious) apartment immediately off Gran Via (Calle Val Verde, albeit, not most inviting street)! But we lived with that! We stayed 3 nights and had dinner in the apartment on 2 of those (because of very late arrival on first night and work commitments on second) - could we have better range of utensils (and a kettle) next time. Checking in and out was effortless. Further plus was that no additional security deposit was required. Very new and well-designed apartment, centrally located (though the neighborhood not the best). Good but Wi-fi not work properly. Thank you for the nice stay in the apartment. We just arrived back home and already miss Madrid! Hopefully we will come back soon! Overall, the apartment is clean and new. More importantly, it's in a great location, a few steps off the main Gran Via area and allows easy walking access to most of the main retail shopping. In the apartment, everything is rather new but also lack warmth. There's no plants, no rugs making the place cold. So, with a little small touches, it should be much better and hopefully the Internet will work next time. Appartement très confortable, idéalement situé et au calme. Nous avons passé un excellent séjour. The apartment had a perfect location, was very clean and Agusto was very friendly and professional. This Madrid apartment is located next to Gran Via Street, just a few steps from Puerta del Sol, in the city centre. A perfect choice for couples, families or group of friends visiting Madrid.